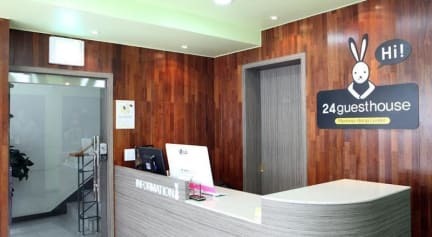 K-stay Guest House md1 i Seoul, Sydkorea: Reservér nu! The fun and unique place, K-stay Guest House md1, was created by Space Innovation Co. Ltd., which is consist of young and innovative group of people who currently works and have passion in the hospitality industry. We are proud to say that with our locational benefits, situated at the center of Myeong-dong, one of the main shopping districts in Seoul, Korea. We are also very close to the popular tourist destination Namsan, therefore providing our customers with the most convenient commute. Making K-stay Guest House the perfect choice of accommodation for customers to relax and relief travelling stress. We also provide the most reasonable price compared to hotels in Seoul, experiences that you cannothave at other budget-hotels or inns with multi lingual young staff in Korean, English, Chinese and Japanese for concierge purpose. In addition, K-stay Guest House md1 is a social gathering place where youcan meet new people and make friends with variety events.